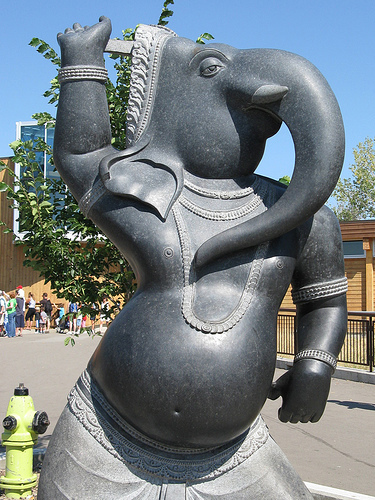 Ganesh statue at the Calgary Zoo. Image by Hold Your Spin @ Flickr. On my last visit to the Calgary zoo seeing the elephants was a high priority. I have been fascinated with these big, beautiful, and endangered species since childhood. But as I wandered by the enclosure I noticed a new addition to the artwork collection at the zoo. A depiction of the Hindu god Ganesh, portrayed as a dancing elephant, met my curious eyes. As an advocate of cultural appreciation, I believe the statue is a fantastic way to expose non-Hindus to the influence of the elephant on the Hindu culture. And this is the zoo’s intent as well. After all, how can we possibly appreciate a culture if there is no way we can ever experience it? Canada is a multicultural nation, one of few in the world with this official policy, and as a result we have a duty as citizens to learn about the cultures that make our country unique. To be clear, I do not think culture should be forced upon anyone. For example, if the statue had a big sign that said, “Hey everyone, Hinduism is the best” I would not be supporting the zoo in this dilemma. All in all, the zoo’s attempt at conveying the relationship between animals and culture through a statue of a religious figure is one that I can honestly support and believe it should not be stifled by a group of over-zealous individuals. This entry was posted on Monday, September 28th, 2009 at 3:44 PM and is filed under News & Announcements. You can follow any responses to this entry through the RSS 2.0 feed. You can leave a response, or trackback from your own site. When I first read about this I was pretty mad. I dislike when religious extremists get so enraged about other cultures or religions that they try to change something people come to enjoy. A little overzealous perhaps… But why bother having a display for Noah’s ark when a zoo is a metaphorical modern day Noah’s ark. Or maybe we should just abolish every zoo in the world because of the metaphorical connotation they serve to actually being a modern day Noah’s Ark, the notion, after all, might be offensive to Atheists and Agnostics. I doubt God’s will is to have a bunch of zealots marching around the world like some sort of crusade depriving the world of culture and knowledge. And I’m sure we can all agree that Jesus Christ was pretty much a good guy if he existed, but if whatever religion you believe in, if it teaches you good morals and values and how to be a good person and you live a good life, why should it matter what religion you are. Amen, sisters and brothers (irony intended). I first heard about this on the CBC Radio (Calgary) and was pretty peeved; however, it’s likely a publicity stunt on behalf of the CCC. The CCC also thinks that people shouldn’t support Obama because it’s been brought up that he’s not a Christian – so much for keeping religion out of politics. The zoo was also making a statement about how animals can be connected with culture involving where the animals come from. It’s interesting that some animals were thought of as Gods. All that the CCC encouraged me to do from their example is to freak out next time I see the crucifix in a public place and demand that it get removed. Canada is multi-cultural, I believe we’re a good example of how different people can get along. I think it’s obvious that the CCC went a bit hysterical and is using it as a publicity stunt. Definitely an overreaction, the statue is art and nothing else. The plaque on the statue names it as Ganesh but not who Ganesh is. Not to mention the fact that all the traditional symbolic imagery normally associated with Ganesh isn’t even present in the statue. Also, Jim Blake seems to be the only person associating his name with the CCC, perhaps he is the only member? I am really looking forward to seeing this statue. I frequented the zoo (member for over 5 years) and it is one of the things I miss most about Calgary. I appreciate that the comments so far seem to recognize the CCC is a small minority that seem to think they speak for the larger Christian community which is quite diverse. Very few people I know would actually agree with this letter (if any).